Stumped by Tigress is a Jams carrot directive for her February Can Jam I poured over dozens of cookbooks, searching for that special recipe with which to impress my lofty canning pals. Carrots are not after all my favorite vegetable to can, or even eat for that matter. I tend like them best raw, shortly after they have been plucked from the earth garnished only with a dusting of fresh dirt. After much procrastination I decided on Vietnams Do Chua, keeping with my recurring Asian pickle theme. 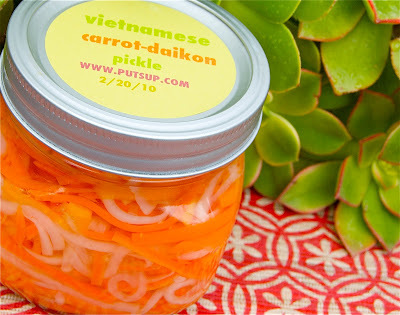 Often scattered on bahn mi, Vietnams answer to the hoagie, carrot daikon pickles are a simple and delicious counterpoint to the sandwiches rich ingredients, pate, roast pork and yes, mayo. Don’t forget, Vietnam was long occupied by the French (hence the pate and mayo). Do Chua adds a complex flavor and crunch to almost anything. Serve alongside rich meats or in a Vietnamese lettuce taco, I like grilled shrimp or pork, with piles of fresh mint and cilantro. And of course tuck them into some crazy PO BOY of your own design. Use a mandoline if you have one, do not grate. Buy large carrots, they are easier to work with. If you plan on using the pickles quickly, you can skip the hot water bath and make these as a refrigerator pickle. Let them sit up in the fridge for week before using. They should stay fresh for a month. Daikon, once pickled can smell a bit cabagey, but it is not reflected in the taste. Start your hot water bath and prepare your jars and lids. Wash peel and julienne carrots and daikon into long strips. In large pan combine water, vinegar, sugar and ginger bring to a boil over medium heat to dissolve sugar. Add julienned daikon and carrots and immediately turn heat off. Place a chili pepper in each jar (if using). Using tongs pack julienned vegetables into hot jars. Ladle hot pickling liquid into jars, pushing down on veggies with the back of a sterilized spoon leaving ½ inch of headroom. Remove air bubbles and adjust head-space adding more liquid if needed. Wipe rims and place lids on screwing on lightly. Place jars in canner covering with more hot water to submerge the jars. Bring to a boil and process for 20 minutes (timed from the boil). Remove lid and wait 5 minutes before carefully removing jars. Place jars on towels or a cutting board. Let cool undisturbed for 24 hours. Wow, this sounds so good. Cannot wait to try it. Still procrastinating on the Mandarin Oranges preserves. I keep buying the yummiest Satsuma Mandarins, and my family keeps eating them. I need to declare some of the produce off limits for my canning obsessions! I am going to make the above recipe and serve it over pulled pork on a sandwich. My mouth is watering!!!! Me too, send me a sandwich! I really love your labels - did you design them yourself? I'd love to have a better look for my jars, but I'm having trouble finding circle labels in a good size - most are far too small. These labels are from the Paper Source http://www.paper-source.com/cgi-bin/paper/item/2.5-Round-Labels/3907.040/37100255.html. They are the 2.5 " size. They come in a host of lovely colors and you can print them from a word label template. Happy labeling! I made these also slightly modified from the Ball Blue Book as well. I was fortunate enough to get both daikon and carrots from my CSA share. They taste delicious but my husband objects to the smell so I need to open them outdoors. Do you think I could use the slice disc in my food processor to get the thin cut? I'd hate to buy another kitchen toy when I just picked up the processor. I haven't made these, but it's important to let these things sit for at least a week - pickles don't taste good until they've properly pickled! As many Vietnamese people who live in my community, you would think I would have known what Daikon was, but I had to Google it. Now that I know what it is, this sounds like something that I would like to try. I pinned it to my favorite recipes so I can try it when I have the canning fever. A Blog about all things CANNED, jams, jellies, preserves, pickles, cordials, chutneys, conserves etc. If it goes in a jar I will write about it. Where to Find Pick-Your-Own Fruit and Vegetable Farms / Orchards for Local, Fresh Fruit, Vegetables and Pumpkins, Along With Canning, Freezing & Preserving Instructions!